I have this bee balm (Monarda didyma) which I got from my aunt. I got a start of it over Memorial Day weekend when I was getting some mums she had that she said she had gotten from my grandmother, the one who wrote the diary. She told me the variety name of the bee balm, but I have forgotten what she said. I also didn’t ask what color the flowers would be. So now I know the flowers will be red, and it occurred to me that I really have no other perennials in the garden with red flowers, so it will be a nice addition. It does seem to be quite susceptible to powdery mildew, and I know like other bee balm, it will self sow. So I’ll have to be careful about where I put it so that the poor looking leaves aren’t so visible, it doesn’t clash with other nearby flowers, and I can control the tendency to self sow. (Hey, I know, I’ll just cut off the blooms before they set seed!) The other nice thing about this flower is I’m sure it will attract hummingbirds. My neighbor will draw them in with her red hummingbird feeder, then I’ll have the real thing for them over in my garden! Cool! I was thinking about other red things in the garden, as I was finishing up some weeding in the vegetable garden. The ‘weed of the year”, purslane, has red stems on it. I weeded out a lot of it this weekend, but I know it will be back. Purslane is one of those weeds where you can pull about 80% of it, to make the beds look a little neater for a while, but you know it will be back and in a few weeks, you will be pulling out bushel baskets of it again. Last year I tried red plastic mulch on my tomato plants. Someone had done some research that said if you used red plastic mulch on your tomato plants, you could increase your harvest by up to 40%. The theory is that the plants sense all that red spectrum light and “think” it is nearby plants creating more fruit than they are, and thus they produce more fruit in an effort to win the battle of who can create the most seed, and thus ensure the very survival of the species. (It’s tough to write about that without using words like sense and think, even though I know tomato plants don’t sense in the way we do, and they certainly don’t think, do they?) I don’t know if it made that much difference in the number of tomatoes I harvested, but I do know I had a lot of cherry tomatoes! hubby was just this evening bemoaning that our bee balm is light purple rather than red. He will be so excited to find out the Gardening Aunt has red bee balm which I'm sure she will share!! So if you let the red-stemmed purslane hang out under the tomatoes, won't it spur them on to greater production levels?? Carol, you may have to wait longer for them, but you'll get more tomatoes for a longer time - our plants have a very short window of fruiting. Some people prune the indeterminate varieties in mid-July, hoping they'll rebound in fall and make a late crop. 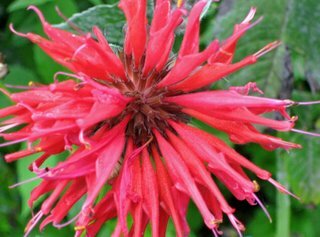 Nice monarda - mine has been in the garden 2 years - never bloomed yet and was from a mix, so I still don't know what color it is! Good idea on the red-stemmed purslane, except for some reason the raised bed with the tomatoes is the only bed in the garden where the purslane doesn't seem to be in control.